Like everything else, there are bad voids and good voids in the world, says City Planning. 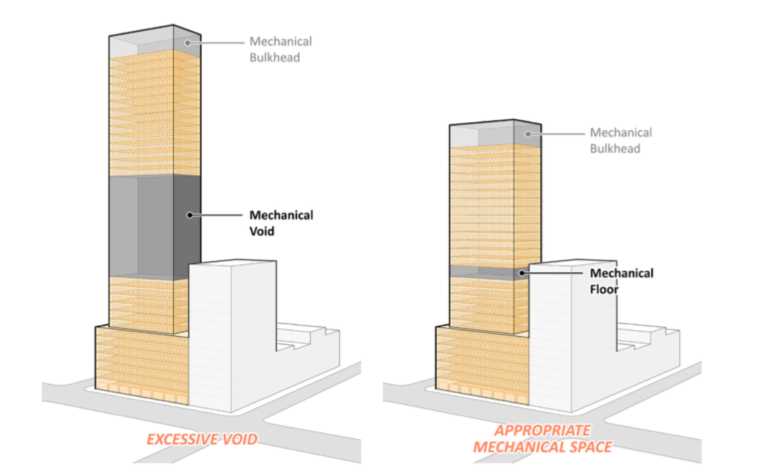 Constraints on allocating space on upper floors to “mechanical voids” shouldn’t ignore lessons that were (one hopes) learned from Superstorm Sandy. Locating essential mechanical services where they can be flooded flies in the face of good design. This means some stuff that historically was in cellars or basements will, in the future, be on upper floors. That’s good planning and good design. Can this be abused to swell a building’s bulk? Perhaps, but new or amended regulations should target abuse, not good planning and foresight. Developers are putting in 125 foot voids in their buildings because of the lessons learned from Sandy. They are doing it out of GREED!